The world is still as difficult and as wonderful a place. 2016 is a difficult and wonderful time to be alive, and I am still struggling to make sense of everything. 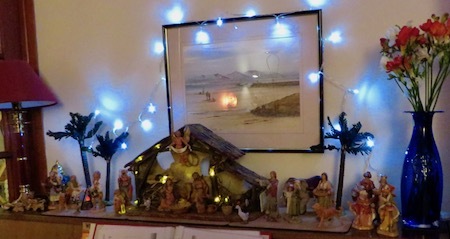 However, there is also a sense of waiting as you can see from the nativity scene above. 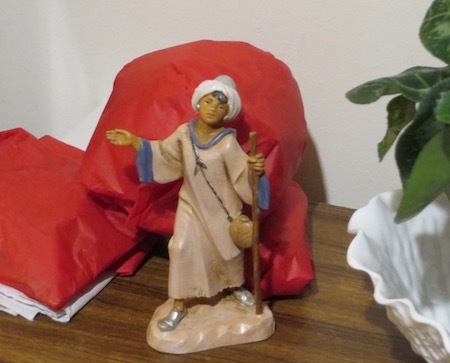 Regular Readers will know that this is our collection of figures from the 5-inch Fontanini series of nativity figures and villagers, with of course the addition of the apostle John. Who says that mysticism is no more. . . . . . ? In actual fact, more people these days are trying to make connections and make sense of their place in the world. Those who have come to the conclusion that there is no God, or maybe that there is no Other, can just take heart from an ancient fable muddled in with the winter solstice. In other words, enjoy the season. Tobias is our new villager this year. He looks as if he has walked a long way through sunsets and giant plants with strange sculptures all around him. He longs to see things change and for people to be happy and fulfilled. That is no bad thing to aim for at this time of year, especially as we are bombarded with adverts for all sorts of charities needing money to make things better. Earlier in the week, in real time and in a real place – The Community Garden – we gathered with a whole host of villagers to walk and watch and participate in the real live nativity play. Thankfully there was no rain though there was good food and wine and good cheer. You can find some more photos here. 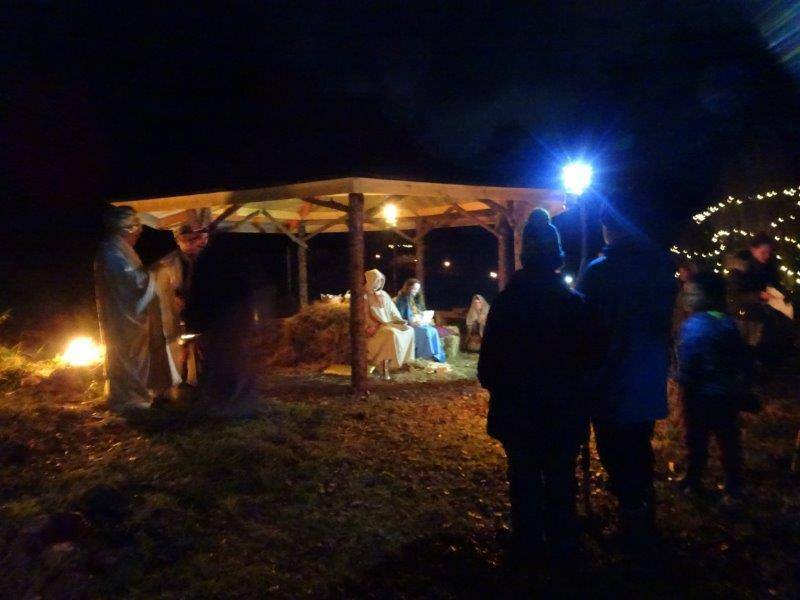 An outdoors nativity certainly gives a perspective of the dark, the cold, the crudeness of the shelter and the importance of fire for warmth and light. I once had to sleep overnight in the car during a storm. We were frightened of the storm blowing our tent away – it was cold, noisy and there wasn’t much opportunity to sleep, and that was in the summer. It always seems apt to me that this Christmas story we celebrate is about a special person being born as someone insignificant, far from home and who ends up with his parents fleeing for their lives to another country. It’s not exactly the cozy narrative we often conjure up in our heads. All the while we were setting up the crib scene guess who was watching? Misty is already excited about the time of year because she saw some presents being wrapped and there is nothing she loves better than having a juicy-smelling package to tear apart. Don’t worry, we don’t get her an Advent Calendar. She is not exactly counting off the days. Still . . . . we will have to watch her carefully over this time of visitors and visits, she is eleven now and tending towards the forgetful. On her way down the hall to get to her place for killing and eating her dentastix earlier today, she shot into the bathroom, looked surprised, shook her head and then turned and trotted into the right door. 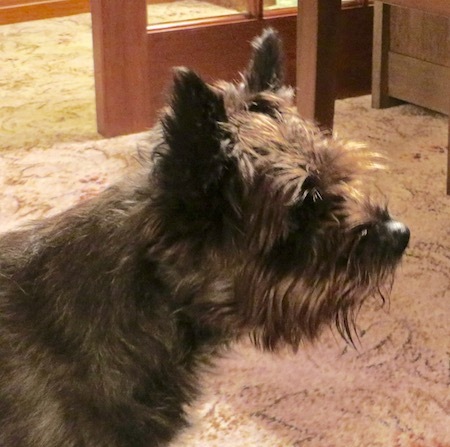 It could have been a moment of forgetfulness – we all have those – or even excitement, but just maybe she is turning quirky rather quickly as she gets older. I only wish I looked as cute as her when I have a senior moment. Please excuse me this post of whimsy. I received quite a bit of feedback from family and friends over the serious nature of the last few items. This is my fight back. Is it too early to say – Have a Happy, Peaceful and Blessed Christmas? Who knows how to beat the confusion that is Brexit? Perchance the same people who know how to understand that the United States of America now has Donald Trump as President Elect. My reasonable, liberal Sunday newspaper tells me in no uncertain terms that the only way to deal with opposing views is to understand as much as possible about the mess we seem to be in, to listen to the person who disagrees with you and also to read a newspaper with the contrary view. As I am an Observer reader that means I should have a look at the Telegraph. The same commentator tells me that if excerpts from the Daily Mail drive me spare, then I should read that paper more often instead of running away with my hands in the air. That is the way of understanding, I hope. And trying hard to understand another’s point of view might help resolve the fog in my brain. So . . . . . . dialogue and discourse and a reasonable attitude will help bring understanding and eventually solve all that ails me. To be honest, I am not so sure. Yesterday’s remedy was to overdose on music videos from youtube. Today’s recipe for lifting the mood has been to browse Christmas cards online and put in an order. Never mind that I am later than usual, let’s just hope that they arrive in time for posting this year rather than next. Of course I am forgetting the panacea of crochet and the way it makes me think of my Granny. The other thing that has been taxing my brain from the papers, is that google is getting things slightly wrong with more and more people and how they think. In other words, instead of simply guessing that my interests trend towards dogs and sick kids, the search engine now seeks to direct my mouse towards vaguely more sinister topics. Perhaps I am being a bit obtuse. Let’s see if I can make it easier. Google software engineers or programmers write an algorithm or set of instructions that has an inbuilt mechanism whereby it gives you more of what you like or want. But now, google suggests topics that lead you into other, totally different areas to explore. Good idea you might think? But wait – apparently typing in a search for Are Jews . . . . . brings up a set of questions one of which is Are Jews evil . . . ? And of course if one clicks on that then a journey towards darkness is set in motion. Yikes, I have just tested google to see what comes up and the evil question comes top. It is as if someone has been reading this blog. Scary and spooky or what? Of course the answer is neither. I hope. But just coincidence. Maybe some computer geeks could explain it to me, for now, it will be a case of steering clear of questionable hooks. By now it should be clear that my brain has been exercised more than usual today. Please don’t think I am going down the route of knocking google, search engines, computers or the internet. The truth is that we live in amazing times. However, the actions and reactions that take place at the speed of one’s internet connection are enough to change the pace of human evolution. One minute we are looking at cute puppies on facebook and the next we are confronted with the horrific images of elephants slaughtered for their ivory. A President Elect on the other side of the world cannot sleep, so dashes off a tweet about Taiwan, say, and the response is an international incident. The prospects for change and growth are enormous; though equally there is much that can go wrong. It has just occurred to me that I am turning into one of the newspaper contributors that started this blog post in its current direction. And so the whole world of information as a process directs the way that bloggers relate to the world and their readers. I fully expect people from all around the world to understand why I get upset about Brexit, Trump, Benefits Sanctions, Aleppo and Terrorism. We are the results of our interactions and long may I be able to read, understand and interpret what is happening. Of course, what I hope is to be able to become part of what makes things better. 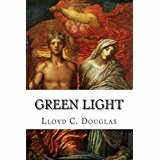 Years ago I read a book by Lloyd C Douglas, it was called The Green Light. It is still available, secondhand in Amazon – another giant of modern life. I wouldn’t go so far as to recommend it, though for old time’s sake I wouldn’t mind reading it again. As far as I recall, the premiss was that the human race moved forwards across the world, and that sometimes we get a red light and have to wait for poorer nations to catch up with those who have more. It is couched in religious and medical terms, the author was a doctor and Christian. The book was written in the 1930’s, a fact which is not unrelated to a comparison of the lead up to World War II with the right wing trend that appears to be sweeping Europe today. If you have managed to stay with me this far, I would value your own thoughts on future events, as well as your own continuing methods for dealing with stress. 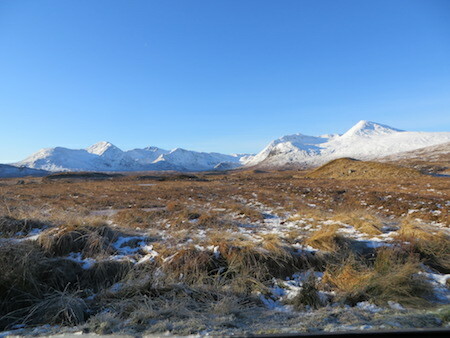 The photo, by the by, is a week or so ago looking towards the Glencoe Range. Everywhere you turn these days there are more forecasts of gloom, doom, increasing debt figures and signs of confusion over how to deal with the UK leaving the EU. It is as if news columnists and commentators can’t get their heads around what has been happening to us. It doesn’t take much imagination to come up with a whole long list of all the bad things happening at home and abroad. The world all of a sudden, doesn’t seem a very stable place. And people are at odds with the views of neighbours, friends and family. As you can see I am still at odds as to how to cope with the negatives all around. So the last few weeks have involved making a concerted effort to find ways to concentrate on the good things in life. 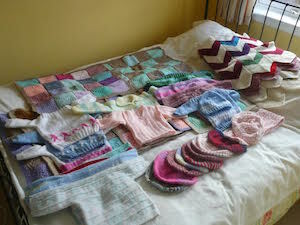 As it is Autumn, the home knitting and crochet of myself and a friend have been passed on for delivery to parts of Africa where they are badly needed. This is the summer’s total, assembled for delivery. I can vouch for the soothing influence of wielding the crochet hook and concentrating on the needs of others – particularly small children. Lorries of collected home-mades travel the length of the country and on to their destinations in unstable countries. They help only a little. But it is a start. Over the weekend HBTW, Misty and myself went to a 50th Birthday Ceilidh. It was unique and very special. Not just because it was in a Cathedral, albeit a small one, but because of the mix of ages and the live band – The Last Tram tae Auchenshuggle. 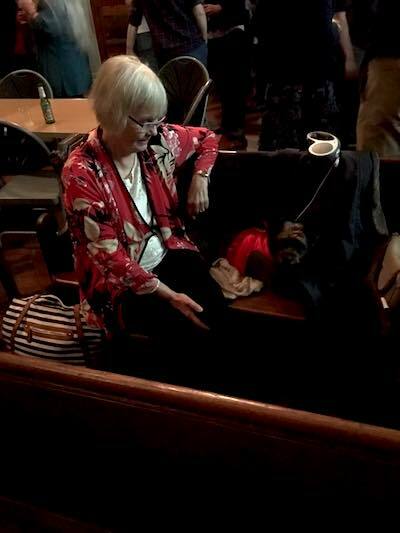 St Mary’s Episcopal Cathedral refers to itself as – open, inclusive and welcoming – and that is truly what it felt like. Perhaps I should mention that they achieve the same sense of welcome in their services as well. Such a recommendation from a dyed in the wool Presbyterian is all the more pertinent. Misty enjoyed wearing a party jacket and making lots of new friends. Apologies for the quality of the photo, it was from Himself’s phone. I was too busy meeting people and catching up with friends to take photos. A friend recently commentated on the tendency of Christians to have miserable-looking faces. I had to agree that by and large older church-goers could look a bit sad and craggy, though I think it is probably more due to age and gravity than disposition. Well, there were no sad faces at this birthday celebration. I find myself reflecting that heaven might be a bit like a ceilidh – boisterous, lots of laughter, food and drink and pleasure in people being together. I used to say to people that heaven was whatever you enjoyed most, or whatever you wanted it to be. My view now tends to be rather more mystical, but a heavenly ceilidh is a good idea. Not too boisterous of course, and come to think of it not too much alcohol. Oh dear, maybe I am turning into one of those miserable faces after all. OK enough of the mystical or non-mystical musings. 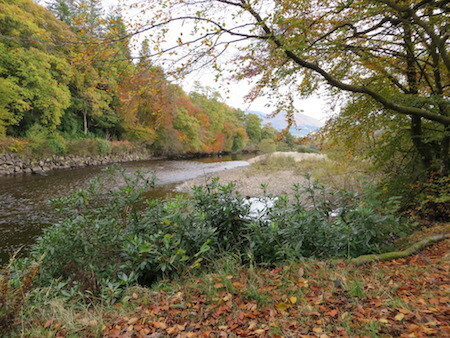 Other ways to try and be positive have involved some lovely walks in the beautiful Autumn weather. We found some new places to walk the little dog and we have enjoyed several picnics. Picnics by the way always have to include hard-boiled eggs and a twist of salt. They make all the difference and are a kind of tradition. Whenever Misty sees the thermos being taken out of the cupboard she starts getting antsy. She knows a Day Out or even a Half-Day is bound to follow. A neighbour was lamenting how fast the year had gone by. Of course what he meant was that the summer was long gone. We stood round as elder-people do, commenting on the fact that time flies past more quickly with each succeeding year. I came home conscious of the fact that I had not done a blog post for a number of weeks; rectifying this has been one of the main things on my agenda for today. Hence this photograph. For me it represents the ideal picnic. Misty is included, we are warm and dry enough to sit outside and all is right with the world. The trouble is that so often these days it is hard to concentrate on the good things in life. Newspapers scream of the latest atrocities in Aleppo or in the Scottish Parliament and positive items seem to get forgotten. I have dreams of writing opinion pieces on this blog which will lift spirits or somehow bump political heads together, then I crash down to reality as I come to terms with the horrible truth that as an individual I can make little difference. I think back to illustrations I have used in sermons about tiny drops of water wearing away concrete or stone, or snowflakes landing on the branch of a tree until the branch breaks. And I think of the medics in Syria and other war-torn areas struggling to make a difference, often under bombardment themselves and faced with shortages of even basic medical supplies and equipment. Then I feel ashamed, because it is all very well talking about practical help but quite another to roll up one’s sleeves and get on with it. I’ve spoken before about my timidity in saying things as they are, because I am anxious about becoming the target of cyber-trolls. Then I get a measure of comfort because after all, people reading What’s the Story. . . . ? 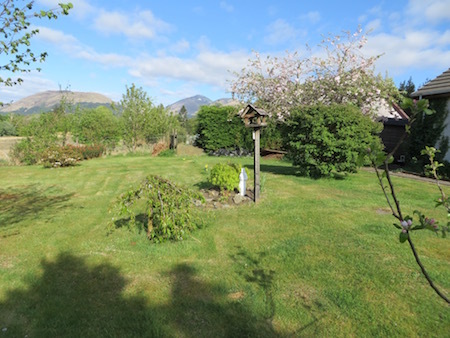 are more likely to be seeking a spot of whimsy or pictures of dogs or the beautiful Highland countryside. My guess is that a lot of people cope by switching off the news or closing the paper. And in all honesty, who can blame them? People still have to earn a living, or find a purpose in each day or simply do the chores and feed themselves or loved ones. It’s difficult to do that whilst wallowing in empathetic grief or helplessness. 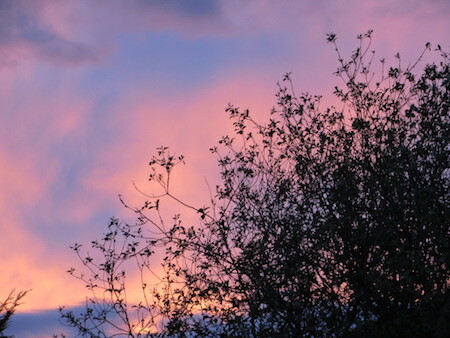 So I forgive myself and like a friend said to me today – think positive thoughts – a kind of prayer if ever there was. 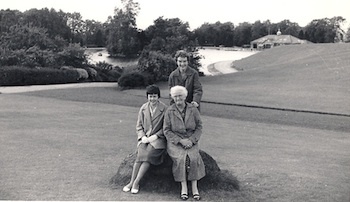 This photo of the three generations of women (my mother, grandmother and self,) illustrates what my inner world has been like these last few weeks. Don’t think for a moment that I have gone quiet or been in sleep mode. I’ve been concentrating on the Dalamory Memoirs, and have reached the time just a few months before getting married. It has involved writing about some very difficult issues. Let’s face it, the relationship between mothers and daughters is often fraught with tantrums, disagreements and misunderstandings. Let me assure you they are not all mine. Anyway, it has also concentrated my mind in particular on the changing role of women in the world over the last fifty years or so. Women suffer in all sorts of ways, just as women know great joy. But in these times of war crimes, death and destruction it seems to me that women and children bear an unequal burden. As a teenager I failed to understand how my parents’ generation could have allowed the tragedy of concentration camps. As a retired elder-person I know how it happened. It must have been a kind of helplessness coupled with a disbelief that people could be so cruel. It is like that now. So somehow we have to grasp every day and live it the best way we can. And if we have a bad day, then we pick ourselves up and try to do better the next day. That brings me back to the seasons slipping past. Autumn is here and inevitably it will be winter sooner that we think. Every September at the start of the new academic year I used to enjoy making pretty diagrams of plans for study and enjoyment and learning new things. Why should it be any different for a retiree? I’m not so clever with my computer and pie-charts, but I could have a go at learning. As the nights draw in – and they are already – indoor hobbies and occupations become important. Perhaps I need a timetable for all the things I keep promising myself to do. This week’s big achievement is to get back to regular piano playing. There is a story there but it is for another time. If you have managed to read this far, how about sharing something from your winter to-do list? Or your thoughts on how to cope with world events. Blessings and positive thoughts from Dalamory to you and yours. They are getting bigger everyday. And there are nineteen of them. The above is one of those presents that brings special pleasures every year. Son #3 gave me this apple tree a number of years ago. 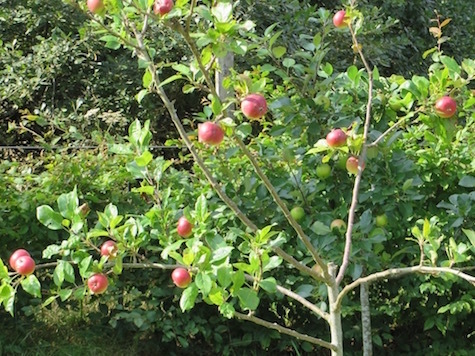 The only trouble is that the presence of these beautiful apples makes me think about Autumn – again. 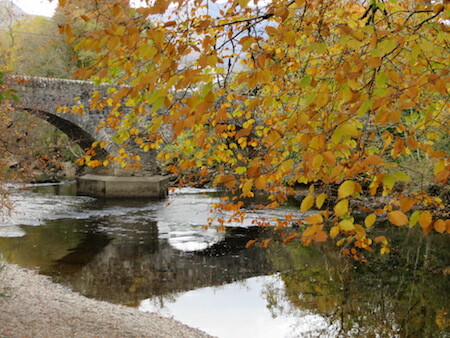 No matter the fact that the Autumn Term has started in Scottish Schools, in my heart summer is June, July and August; while autumn is the latter part of September, October and part of November – the time when the leaves turn gold and start to fall. That is what comes of having been brought up in the South of England. And I have never got used to HBTW‘s attitude of Autumn being in August, because in southern England temperatures are still in the twenties centigrade. I know that the opposite is true in the north of Scotland, but I feel like stamping my size four and a half, and shouting, “Oh no – summer can’t be over already.” Still, this is what happens every year after our Wedding Anniversary – I should be used to it after 51 years. So I suppose that rant is over and I can go with the precious summer days that are in my heart. At least I can today, because it has been a warm sunny day with swallows still swooping and peacock butterflies lazing on the wildflowers. 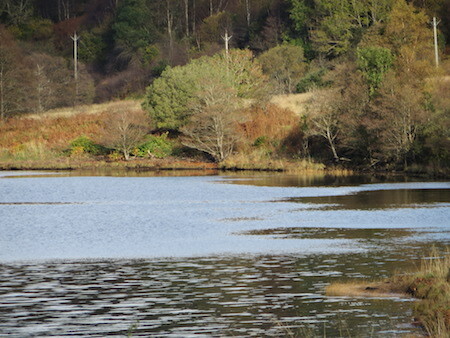 We have been making the most of the weather to enjoy several outings. 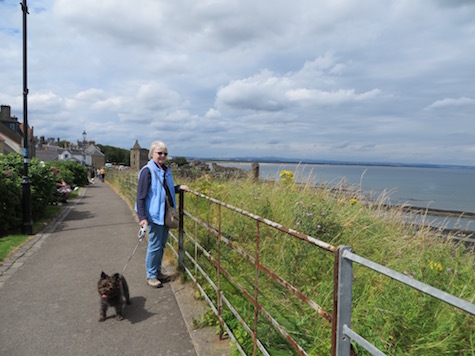 This was a day out in St Andrews, spent along with reminiscences of my time there as an undergraduate – rather a mature one, but someone who was pleased to make the most of the gift of three years of study and research. It was a busy time and I knew at the time that it would pass all too quickly. To be honest, I looked forward to being qualified and becoming a full-time Parish Minister. The only thing that really surprises me is how quickly the years have gone since I have been retired. 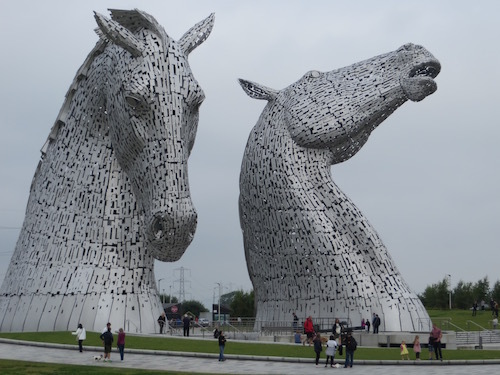 A day to the Kelpies at Falkirk. A tour of Fife on a wet day. A few days spent with Son #1 and his family and the Olympics on TV. Loch Lomond and a picnic at Luss. Time seems to rush past and I am grateful for the health and energy to be able to enjoy living in such a beautiful part of the world. On wet days I dream about all those indoor pursuits I am intending to catch up on; there is the ongoing task of writing up my Memoirs – it is coming on slowly because I keep getting diverted into ever more detail. Housework is not quite at the bottom of the list, but dusting is never a priority. 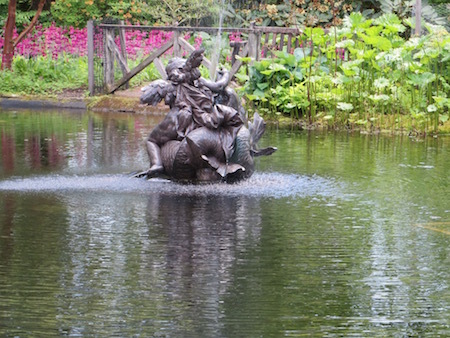 After all, who wouldn’t rather wander round these iconic sculptures than stay indoors with a mop and a duster? 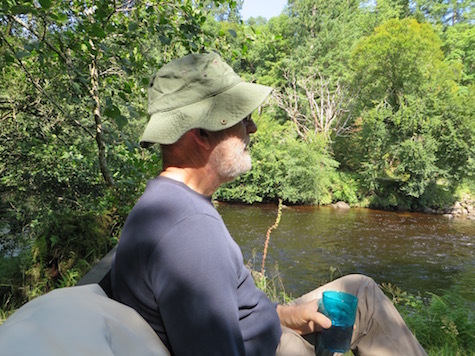 If asked to sum up this rambling blog post, I reckon it would be about making the most of the latter days of summer, though in truth we would do well to always make the most of the here and now whenever possible. I spent so many years writing sermons that I am tempted to go into the range of possibilities of all the things that come along, good and bad. But this isn’t a sermon, and the last thing I want to do is to preach at you, Dear Reader, what I want for you (and me) is more happy summer days and a gentle acceptance of the crisp beauty of autumn, when it comes. I just don’t want it to be too soon. It was a fine day as far as I remember. I was eight years old and sitting in the back of a car. That was unusual enough, because our family had no vehicle and we only knew two people who did. We were in a neighbour’s car and I sensed that this day was one I would remember all of my life. Funny how such a young person can know momentous when it is simply there before them. I looked out of the window at the blue-grey sea and saw the ship sailing down Southampton Water. My Aunt and her two children were on the vessel bound for the other side of the Atlantic. They were sailing away to a new life, looking forward to joining my Uncle in Canada. I felt lost, missing them already. They had spent the last few weeks with us, waiting for confirmation of an embarkation date. It had been a special time, especially as I was an only child; being one of a gang of three all of a sudden was a revelation. Auntie B was my Mother’s older sister and during those few weeks there was more laughter ringing out than I had ever felt in my short lifetime. She devised special tasks and games for us three children and we somehow knew we were blessed. After the potatoes were peeled – the mainstay of any meal in the 1950’s – we were all allowed to stand round the basin and peel the peelings all over again. I can remember self-righteously saying that my Mummy would have peeled the peelings so thinly that there would have been no chance of peeling them all over again. My cousins looked at me pityingly and my Aunt simply laughed knowingly. That was the essence of the difference. My Mother was the serious one, always worrying, always trying to scrape the last bit of margarine off the paper, always wanting to make things right. Yet, even she melted in the midst of the sunshine of Aunt B’s smile. There was a softening and a whole summer – or so it seemed – of visits to the playpark, picnics in the garden and dancing to the tunes on the radio. Of course, Auntie B was full of the knowledge that she would soon be setting off to join her much-loved husband. . . . . . . and a new beginning in a new land. There were tensions around the enlarged family that summer, possibly to do with the younger sister seeing evidence of a love of life that she had somehow lost. 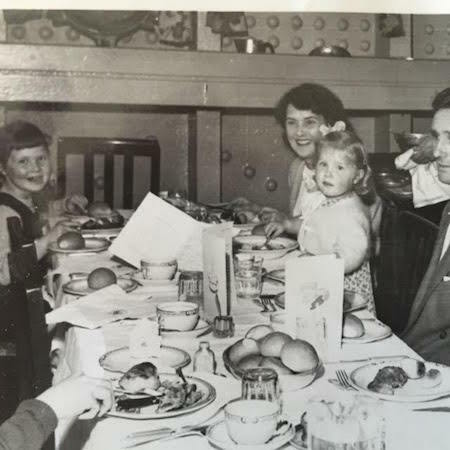 My poor Mother had married on the rebound; her decision to marry my Father was to mean moving away from home – Scotland – going 400 miles south to the big metropolis that was London. Unfortunately her marriage was clouded by stresses that I could not even begin to understand. In the main, she focussed on a wish to return to her homeland, and I guess that this featured in the evening talks the two sisters were able to have whilst my Father worked late. There would have been comparisons drawn between Auntie B and 3500 miles distance and the relatively easy commute between Glasgow and London. No wonder it was such a significant summer. Over the years, the Canadian cousins became five – four sisters and one brother. Letters were the only means of easy communication, and my parents split up and eventually divorced. In the fulness of time Aunt and Uncle came to Scotland for a visit, spending time with my Mother and then with my own family. Perhaps B’s example helped us on our way to growing a family of four sons. The youngest was only weeks old when the Canadians came to the backwoods of the Outer Hebrides. How we landed up there is a whole other story, and at the rate that my Memoirs are coming on, I may never get it written up. B was still the special person I remembered and her spouse was as complicated and charismatic as ever. Over the years and now into the internet age and through easier travel, the Canadian cousins feel very much part of my life. The photo above, taken aboard the ship in 1952 was sent to me recently by one of my cousins. I cannot possible overstate the joy it gave me. Somehow it filled in a gap and showed me how my memories squared with reality. Sadly, those two sisters born before World War II are no longer with us. Their legacy remains. When I posted at the end of June I was much occupied by Brexit – the vote to leave the European Union – and the shock it had engendered. Politically things have been changing fast and furious. This beautiful photo has been like an antidote. Much needed and greatly appreciated. May you find your own form of positive vibes. It is a truism that people often say, “I don’t know how I ever had time to work . . . . .” The days slip by so pleasantly that I find myself thinking the same, however, this past week is a good example of how time can be expanded to achieve goals and objectives as well as treats and fun-time. My main concern right now has been to actually sit down at the computer and get writing. Perhaps I should say Writing with a capital W. I think it has been a surprise to those who know me, that the promised book has never appeared. Today I found myself explaining to someone how eleven years of retirement had passed me by with very little to show for it, other than the blog posts and a few facebook entries. Retirement was thrust upon me due to ill health. I’ve told people that so often that it kind of trips off the tongue. But the point is, that now I am feeling better than many a long year. Ok I know that could be seen as tempting fate, but it is worth saying it again. I have space in my head to gather thoughts and form words and actually get serious with my trusty computer. And it is a lot more healthy than concentrating solely on newsprint and other media, especially with so much vitriol and nastiness to add to the awful fact of war, violence and crime. I know it is important to be well read, particularly with the decision we all have to make in the UK about Europe and the EU, but. . . . . . .. life is about good things as well as difficult and dark things. I know several people right now who are determined to make the best of really hard situations. The least I can do is to write the wretched book I have been promising for years. Of course, I expected to write the grand novel, the one that everybody is supposed to have in them. But a bringing together of memories for those close to me, is every bit as good. As well as being easier. For instance I sat down today and two hours disappeared as I flew back in my mind to rationing and postwar London. And I realised I am grateful to have had the life I have had. And today’s life is pretty good too. During this past week, HBTW Misty and I took advantage of the good weather and declared a Day Out. 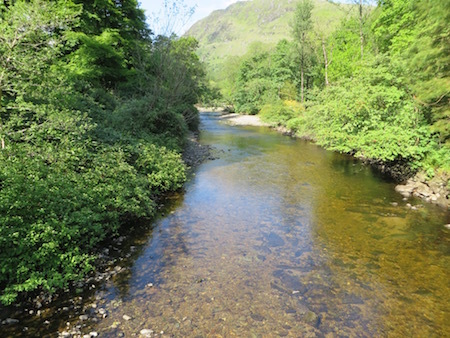 This pretty river is at the boundary of Benmore Botanical Gardens where we wandered, very happily like the three old codgers we are, for several hours. 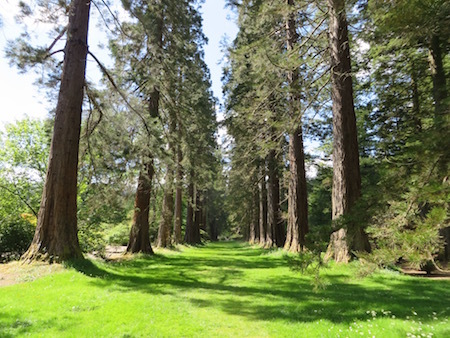 The Redwoods at the top were planted in 1863 and are already 40 metres high, well on their way to becoming enormous guardians of the garden. There are over 300 species of rhododendrons, many azaleas and a huge variety of trees. 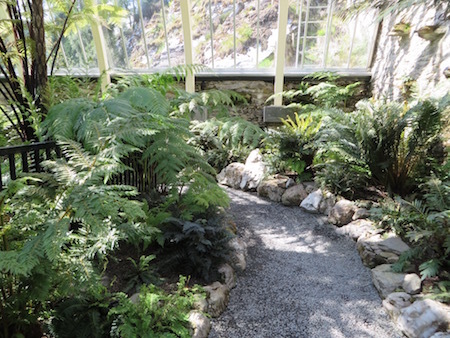 But the restored Victorian Fernery was, for me, the icing on the cake. By the way I had an iced empire biscuit at the cafe and very good it was too – that and a pot of Earl Grey tea. My point is, that life is a mixture of all sorts of things: good, bad, indifferent, hurtful, disappointing, joyful, wonderful and all sorts more. To take enjoyment in the day and to live it to the exclusion of everything else is a rare gift, one which is to be celebrated. I remember so well how difficult it was when my sons (4 of them, by the way,) were young. But the secret then was to do things that they could not help but enjoy. Things like, jumping down giant sand dunes, damming streams, collecting hens’ eggs, playing with puppies, all the sorts of things we used to do before computers and social media. I’m not saying technology is bad – but it is different. 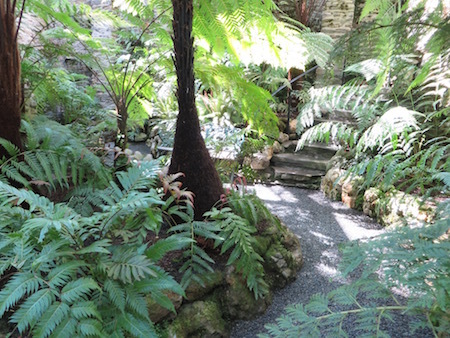 Back to Benmore Gardens – I had to struggle up some very steep and winding steps to actually get to the Fernery. And it meant braving a dark and forbidding looking entry which was the equivalent of being at forest-floor level beneath the high canopy of trees in the rain-forest. 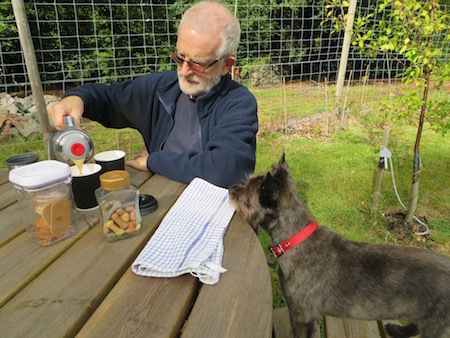 Himself and the dog had to wait outside, though HBTW had his own tour while I recovered in the sun with Herself. This week has been a lesson in how to make the most of life. I know I am in a fortunate place health-wise and that others are less able. I know that the weather has been incredible. And I know it is easy to be cheerful when the sun shines. The hope is that if and when a dark day comes along, we will have built up a reservoir of spare capacity. And more than anything, I hope we can share some of the good experiences with others. What’s been good in your life this week? This is just to prove that when we get good weather in Dalamory, we really do get good weather. 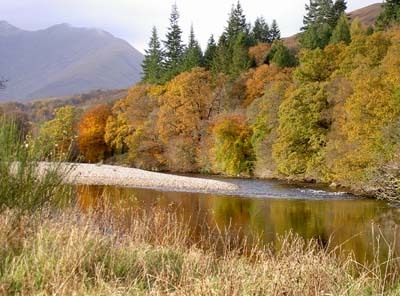 Indeed Argyll – mountain, glen, loch and seashore becomes a magical place. It is only a week since we came back home after a 6-day break in the pretty Border village of Newcastleton. We used to live there back in the 1980’s. Our sons went to school and uni and for six years we enjoyed the slower pace of a village that has a mind of its own. The photos on the link above are much better than any of the ones I tried taking; my excuse is that the weather was a bit iffy though it didn’t spoil our enjoyment. It was our first proper foray into Holiday-Cottage-Land and we had a great time, (so did Misty.) There was also a family garden-party to attend, so we met lots of friends and relatives. It all set me off thinking about family folklore and stories from those days. One of those tales was the subject of some hilarity with Son #3 recently, so it is worth the retelling. Will I say which son was involved in servicing his bicycle with a car foot pump? Of course I will, it was indeed #3 himself. He was about 8 years old at the time and no doubt thought it would be a good wheeze to acquire Father’s foot-pump from the car or maybe garage, to lessen the work of pumping up his bike tyres. He leaned the bicycle up against a tree in the village square right outside the house. Grandma and Mother happened to be looking out of the window and were watching proceedings with interest. He fiddled about a bit and managed to connect pump and tyre with relatively little bother. Then, he proceeded to pump his foot vigorously up and down with a look of intense concentration on his face. I can see him now in my memory – what a pity there were no handy mobile phones then. Suddenly, there was an almighty BANG . . . . . . . . . Said Son leapt in the are and then ran away, looking extremely frightened. Eventually, when he realised he had not blown up the village he wandered back sheepishly. Mother and Gran collapsed in giggles. Of course the best bit was that he had no idea he was being watched. These are the kinds of tales that have to be included in the Memoirs. Now I simply have to get on with the task of somehow setting them in context. I’ve not settled recently to any serious Writing, we have been far too busy. I know, I know, I have to make the time or the days will slip away. I actually enjoy sitting at the computer sharing stories, thoughts and dreams, so I do believe it will happen. If I’m spared and well as my own Granny would often say. It is good to have lots to keep body, mind and spirit occupied. Blessings on you and all your activities. By the way, has anyone got any good memoirs stories to share?